I was at this convention some time ago now, promoting our game and looking for potential new players. One thing I've learned is to keep a chapter going you always have to be looking for new players. I started a conversation with a gentleman who said he'd run his own chapter in another larp game for some time with great success. He went on about his group and the games they were able to run as I practically salivated. But he went on to say that it all came to an end when the game "owner", as some games are franchises the rights to rules held by some central authority, turned on him and undercut his efforts in some power trip that destroyed his spirit and his chapter. I'd heard that story before, and had similar experience, and its always a soul crushing ending to something you put so much energy into. But I was still riding high on his stories of glory and imagined if I could reignite this guy's love of larp he would be an amazing leader, if I could just sell him on my game! "We're different! There's no franchise, no authority over you! And our game is AWESOME!" But there was no selling him. 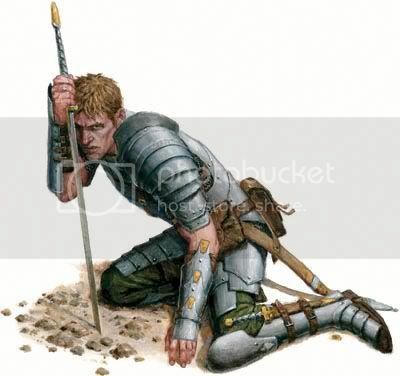 He'd been burned too badly, he'd picked up his pride and moved on to other things, leaving his love of larp behind. It kills me that so many charismatic capable leaders in larp have been burned one way or another and never come back. I know larps are full of player politics that can divide and destroy groups. I know how it happens all too well. But we need those people in our community! Effective leaders are few and far between and I feel we need as many as we can hold on to. My question becomes how can we bring these high quality players back into larp? What is it that can renew their interest without recreating the things that drove them away? I had an opportunity to ask a couple of retired players just this question. Here's what I got. Lisa T.- "I initially left years ago because the drama-to-fun quotient had diminished enough that I had no interest in going back. This was, of course, a by-product of politics, stick-jockery, and my (at the time) low self-esteem. Provided a more vibrant community and the means to do it, I'd be willing to try again. Probably won't be [previous game], though, if I ever do. I went to check out a park in 2008 with [spouse], and we found the head dude in charge had a tendency to cheat at ditch battles. We didn't go back." Sounds familiar enough. Leaders who cheat, sport fighting rather than roleplay, and player infighting. I know sport fighting has its appeal, but it isn't for everyone, and I've seen the testosterone fueled slugfest crowd out other options and other players. For Lisa it seems she's just looking for those other options of play in a group that hasn't found the player drama llama. "Currently for me it's money and distance. I live in Waco, the spouse is in school, we have one vehicle, and till said school is finished, we do well to afford the bills month to month, to say nothing of garb, gear, and gas. I am very interested in returning to it when circumstances allow. I'd rather not be a half-assed gamer relying on bummed rides and loaner gear. It's not fair to anyone to do that. Moreover, I'm fortunate enough to make my Survival Tokens via remote at the house, but the spouse works weekends, and he needs the car for that...so for now at least, it's something of an obligatory hiatus." Like my friend at the con, Lisa has moved on and is now invested in other life goals. I know that's the way life goes, and it isn't a bad thing. It's just hard for me still in larp to not wish others still had the time and resources to play with me. Another ex-player had this to say. Courtney T- "I would LARP again, but for a few things: 1. When I left LARPing, the community I was involved in was starting to devolve into lots of fantasy-vampire crossover, which I INTENSELY DISLIKE and therefore avoid. It might have been the youth factor (lots of older teens involved), but biting necks and soft-core petting is not LARP to me. 2. Not a fan of SCA, and they're the only ones I know of around here. I like boff weapons only, not the hard stuff. (That being said, I am sure there *are* boff-only communities in Austin, I just don't know of them.) 3. My husband would never in a million years join me, and we spend little enough time together as it is, as we both work regular 8-5, 40hr/wk jobs. If it were a hobby he would also enjoy, we'd be there. 3a. If I went alone, without husband, I'd be afraid of attracting the wrong sort of attention. (This has happened to me before.)" Courtney touches on a couple things here, those being the vampire larp culture, or Vlarp, which can be overtly sexualized more than stick-jock boffer groups, and young groups of players, that I'm guessing were drawn to this style of larp. I played briefly in a Vlarp game and, though it didn't get me any action, I can see how other groups might be more of a venue for finding dates... or something. More adult players like Courtney aren't interested in that “sort of attention”. Also she is unaware of games that may suit her style that are in the area. This may be the easiest obstacle to overcome. I know there are at least five different boff-only games in Austin! At least one may get her geared up again, and maybe even her husband! I think what I'm getting from these examples is old players need to be welcomed back. They need to be listened to to find out what they want, and given new options that they haven't played before. Sometimes they just don't have the interest any more and are already busy with new things. I guess what I'm finding is the biggest player killer is real life. It sneaks up on you and demands your attention, your energy and time. People change and what they find important changes. It still kills me that we've lost these players, leaders, and organizers. They were some of the great ones.